Stephen Graham Jones has romped through a dizzying variety of genres in his novels and short fiction. Drama, crime, horror, science fiction, bizarro, and sometimes a strange mash-up of any or all of the above—the list of his chameleonic literary contributions goes on and on, with the common denominator being that he does it all really, really well. In his latest novel, Mongrels, Mr. Jones takes a well-worn supernatural trope—the werewolf—and subsequently weaves a coming-of-age tale that is powerfully unique and highly entertaining. 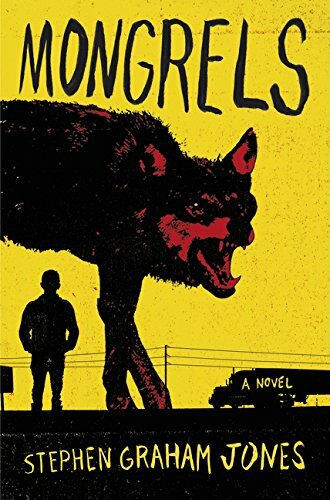 Narrated by an unnamed teenager living with his aunt and uncle, Libby and Darren, Mongrels describes a dysfunctional family constantly on the move through the American south. The reason for their migration is simple: They’re werewolves. Dodging everything from the law to curious hunters, every few weeks they end up having to make a new life for themselves, settling into new homes, new jobs, and (for the narrator) new schools. Alternating with the family’s present journey are a series of flashbacks, told in a reverse-chronological, third-person narrative, describing the protagonist at younger and younger periods in his life. In these chapters, the protagonist is described in different roles, depending on the situation at hand: the vampire, during one Halloween; the reporter who’s working on a school report; the mechanic helping Darren at a truck stop. Of note also is that the bulk of this novel’s opening chapter (in which Libby and Darren are taking care of their elderly and erratic father), along with a smattering of later points, is actually an expansion of Jones’ tale “Doc’s Story,” from his recent collection, After the People Lights Have Gone Off (2014, Dark House Press). Jones’ take on lupine shapeshifters is at once familiar and groundbreaking. He never over-elaborates or prettifies the species by painting them in science-fictional, melodramatic, spiritual, or legendary lights; they are, simply, werewolves. Many familiar elements are dissected (such as where all the fur goes when shifting back to human form, and how many calories get burned as a result of shifting), whereas others are questioned or even dismissed (their transformations have no connection with the phases of the moon, and they can be blood-born, not just changed). There’s even a humorous but logical running theme through the novel about werewolves being careful to take out the trash at night, because their unrelenting hunger may cause them to devour things that they can’t digest—or that could kill them. There are a number of truly laugh-out-loud moments in the book, not a few of which occur as results of Darren’s laid-back, happy-go-lucky (if short-tempered) attitude. And although not a horror novel, the line between humor and tension is often blurred to the point of opacity as some of the family’s situations escalate to shocking and even terrifying levels. Although largely a bloody comedy of errors, there is a permeating sense of melancholy throughout Mongrels. Having to always stay on the move, the family doesn’t get to make lasting relationships or friends—and not necessarily as a result of their violent nature. All along their wild journey, they run into a number of unexpected dangers and tragedies. They’re all too aware of the fact that every time one of them set foot (or paw) outdoors may be the last they’ll see of each other, and as a result their biggest mission is to try and stay together. Hilarious, painful, fascinating, and satisfying (often all at once), Mongrels will easily be remembered as one of the most unique and unforgettable werewolf tales ever written. It’s both a postmodern deconstruction and a wild love letter to a classic creature of legend, told in a way that only Stephen Graham Jones can tell.